I very seldom do this, but one day when my daughter and son-in-law were coming for supper, I decided to make the entire menu of a column in Fine Cooking Magazine (no. 96). I made the chicken stew, saffron couscous, arugula salad with almonds and even the ginger creme brulee. It was all outstanding and this recipe has become a favorite dish in our house – so much so, that my 11-year old, Yitzy, requested this for dinner on his birthday. It is a large recipe and easily feeds a crowd of ten to twelve. Its’ Moroccan flavors lend a homeyness to the dish while infusing the entire house with delicious aromas during cooking. Season chicken all over with 2 tsp. salt and 2 tsp. pepper. Heat the oil in an 8-quart Dutch oven over medium-high heat. Working in batches so as not to crowd the pan, brown the chicken all over, about 3 minutes per side, transferring each batch to a plate or bowl. It’ll take about 4 batches and 24 minutes total to brown all the chicken. The bottom of the pan will be brown, that’s OK.
Reduce to medium heat, add the onions and garlic and cook until the onions are softened and golden brown, 5 to 6 minutes. 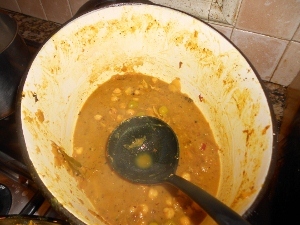 Add the turmeric, cumin, coriander, chiles, cinnamon sticks, and bay leaves, cook until fragrant, about 1 minute more. Add the chicken broth, lemon zest, and 1/2 cup of the lemon juice. Cover and simmer over medium-low heat for 30 minutes. Return the chicken and any accumulated juices to the pot. 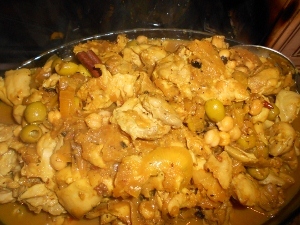 Stir in the chickpeas and olives. Increase the heat to medium high and simmer uncovered, stirring occasionally, until the chicken is cooked through, 6 to 8 minutes more. Stir in 1 Tbsp. of the remaining lemon juice and season to taste with salt and pepper. Serve over the Saffron Couscous. Put the couscous in a large bowl, set aside. In a small saucepan, heat the chicken broth, butter, saffron, and 1 tsp. salt over medium-high heat until the butter is melted and the broth is hot. 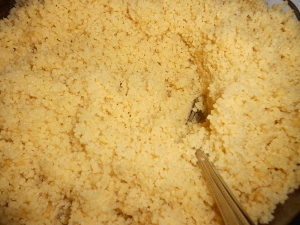 Pour the mixture over the couscous. Cover the bowl with plastic wrap until the liquid has been absorbed by the couscous, 10 min. Drizzle with olive oil then using a fork, gently mix the couscous and break apart any clumps. Hey just wanted to say that the recipe looks quite nice, possibly may have to shrink it down when i try it but it looks awesome. One thing to note is that couscous is actually made with wheat and thus isn’t gluten free. While this is unlikely to catch a well practiced Gluten Free person unawares, it may trip up someone who is not gluten free but finds themselves in the situation where they must cook for one who is Gluten Free. Some good alternatives would be rice, or possibly quinoa (though quinoa would make it a super high protein dish). This recipe makes a huge amount so you can shrink it or freeze some for another time. Thank you for bringing to my attention that the couscous attached to this recipe is not gluten-free. I have changed the classification. You’re welcome, I figured it was an honest mistake. I was pretty sad when I learned that having to be gluten free involved abandoning my favourite side dish, couscous. Fortunately there are lots of other grains out there to sub for couscous, so I’ll definitely be filing these recipes away for later. It looks as though you have changed the original couscous recipe. Fine Cooking’s version says to bake the mixture in a 9×13 baking dish for 10-12 mins. Any reason for the change? I usually follow directions on the package of couscous, which calls for boiling water and pouring it over the grains and letting it sit for a few minutes. I thought it was easier than baking it.